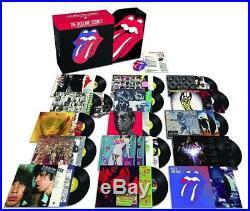 Studio Albums Vinyl Collection 1971 – 2016 [20 LP Box Set] – Rolling Stones – Pre Order. ATTENTION: This is a PRE-ORDER Title. You will not receive this item before the Release Date. EVERY ROLLING STONES STUDIO ALBUM FROM 1971 ONWARDS. SOURCED FROM THE ORIGINAL MASTER TAPES. REMASTERED AND CUT AT HALF-SPEED AT ABBEY ROAD STUDIOS. PRESSED ON HEAVYWEIGHT 180 GRAM BLACK VINYL. INDIVIDUALLY NUMBERED, LIMITED EDITION WITH ORIGINAL PACKAGING REPLICATIONS. ALL BOX SETS INCLUDE DOWNLOAD CODES FOR HIGH QUALITY DIGITAL VERSIONS. Whenever The Rolling Stones do anything, they do it with quality and gravitas. Having defined rocknroll in the 60s, The Rolling Stones entered their imperial phase in 1971 with Sticky Fingers. What followed is a run of albums that couldnt have happened at any other time, by any other band: the decadent excess of Exile On Main St, the Jamaican voodoo swamp of Goats Head Soup, the disco and punk-infused prowl of Some Girls. With each new decade, the Stones evolved while staying true to their roots, coming full circle in 2016 with Blue & Lonesome, a love letter to their first inspiration: the blues. View the unboxing trailer here. Every album has been lovingly remastered and cut at revelatory half-speed at Abbey Road Studios, from vinyl specific original tape transfers designed to get the very best possibly sound from the format. Each album is pressed on heavyweight 180-gram black vinyl and includes a download card for HD digital redemption of the catalogue and includes a numbered certificate of authentication. Cut at half speed, these are among the highest quality vinyl pressings that these classic Rolling Stones albums will have ever received. Half speed mastering and pressed to a very high standard ensures top notch sound quality for the listener. Special care has been taken to create packaging to the same high standards, with detailed artwork reproduction for each album including Some Girls, which comes housed in the replica design including 20 cut-outs on the cover, while the sleeve of Sticky Fingers is presented as Andy Warhols original design, complete with a working zip with a hidden image underneath and Exile On Main Street comes with a set of 12 original postcard inserts. Abbey Road Studios engineers have been cutting grooves into discs since the studios first opened in 1931. In 2013, award-winning engineer Miles Showell joined their existing mastering team, bringing a wealth of disc-cutting experience with him. One of the artisan techniques offered by Abbey Road Studios that results in the very highest quality sound reproduction is Half Speed Cutting. This process involves the master source being played back at precisely half its recorded speed while the cutting lathe is similarly turned at half the desired playback speed. This allows the cutting head twice the time to cut the intricate groove, allowing considerably more accuracy with important matters such as frequency extremes and micro-dynamic contrasts. The resulting cuts have excellent high frequency response (treble) and very solid and stable stereo images. Its not quite as simple as running everything at half rate. There is an EQ curve applied to all vinyl records and by running the lathe at half speed, all the frequencies are wrong. However, the technical staff at Abbey Road Studios have had new custom-built filters installed which allow Miles to practice half speed cutting to the full on a modified Neumann VMS-80 lathe. LP sleeve presented as Andy Warhols original design complete with working zip and hidden image beneath. Exile On Main St (1972) (2LP). 2LP in original style gatefold sleeve complete with inner-bags and set of 12 perforated postcards. Goats Head Soup (1973). LP in gatefold sleeve with two inserts. Its Only RocknRoll (1974). LP with original heavyweight inner sleeve. Black And Blue (1976). LP in gatefold sleeve with original inner bag and lyric sheet. LP housed in replica design including 20 cut-outs on the cover. LP with original sized poster. LP with original heavyweight inner sleeve and lyric sheet. LP with original heavyweight inner sleeve, red shrink wrapping and bespoke sticker. LP complete with original inner sleeve and sales insert. Voodoo Lounge (1994) (2LP). 2LP gatefold sleeve with original lyric inners. Bridges To Babylon (1997) (2LP). 2LP with original lyric inners. A Bigger Bang (2005) (2LP). Blue & Lonesome (2016) (2LP). 2LP gatefold sleeve with original inners. The item “Studio Albums Vinyl Collection 1971-2016 20 LP Box Set Rolling Stones Preorder” is in sale since Thursday, May 31, 2018. This item is in the category “Music\Records”. The seller is “deepdiscount” and is located in Shepherdsville, Kentucky. This item can be shipped to United States, Canada, United Kingdom, Denmark, Romania, Slovakia, Bulgaria, Czech republic, Finland, Hungary, Latvia, Lithuania, Malta, Estonia, Australia, Greece, Portugal, Cyprus, Slovenia, Japan, China, Sweden, South Korea, Indonesia, Taiwan, South africa, Thailand, Belgium, France, Hong Kong, Ireland, Netherlands, Poland, Spain, Italy, Germany, Austria, Israel, Mexico, New Zealand, Philippines, Singapore, Switzerland, Norway, Saudi arabia, United arab emirates, Qatar, Kuwait, Bahrain, Croatia, Malaysia, Brazil, Chile, Colombia, Costa rica, Panama, Trinidad and tobago, Guatemala, Honduras, Jamaica, Antigua and barbuda, Aruba, Belize, Dominica, Grenada, Saint kitts and nevis, Saint lucia, Montserrat, Turks and caicos islands, Barbados, Bangladesh, Bermuda, Brunei darussalam, Bolivia, Ecuador, Egypt, French guiana, Guernsey, Gibraltar, Guadeloupe, Iceland, Jersey, Jordan, Cambodia, Cayman islands, Liechtenstein, Sri lanka, Luxembourg, Monaco, Macao, Martinique, Maldives, Nicaragua, Oman, Peru, Pakistan, Paraguay, Reunion. Who – Studio Albums Box Set [Vinyl New] Label: GEFFEN Format: LP Release Date: 04 Dec 2012 The Item is brand new and unplayed. 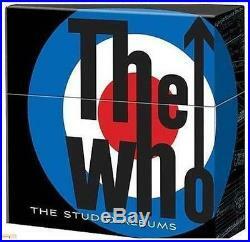 The 2012 box set The Studio Albums contains new vinyl pressings of all of the Who’s studio albums, all from relatively recent remasters by Jon Astley, all containing replicas of the original inserts from the original pressings, all housed in an attractive box. It’s a handsome, attractive way for vinyl fanatics to get the Who’s entire catalog at once. The item “Who Studio Albums Box Set Vinyl New” is in sale since Sunday, October 16, 2016. This item is in the category “Music\Records”. The seller is “get_importcds” and is located in Sheperdsville, Kentucky. This item can be shipped to United States. 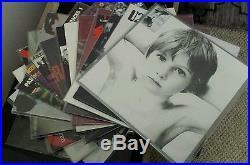 A complete set of u2 studio albums plus their 2 ep’s. All the records are mint and covers range from excellent to mint. Here are the details: Boy – 180 gram new October – 180 gram used War – 180 gram used Under a blood red sky – 180 gram new The unforgettable fire – 180 gram new Wide awake in america – new The joshua tree – 180 gram used Rattle and Hum – 180 gram new Achtung Baby – 180 gram used Zooropa – used Passengers – used Pop – new All that you cant leave behind – used How to dismantle an atomic bomb – used No line on the horizon – 180 gram used Wide awake in europe – 180 gram used Songs of innocence – 180 gram used. The item “U2 studio ep album complete collection box set lot vinyl record (europe, atomic)” is in sale since Friday, March 25, 2016. This item is in the category “Music\Records”. The seller is “nelsonmoralesjunior” and is located in Absecon, New Jersey. This item can be shipped to United States.